Sultana, H., Suter, H.C., Armstrong, R., Nicolas, M.E. and Chen, D. 2018. 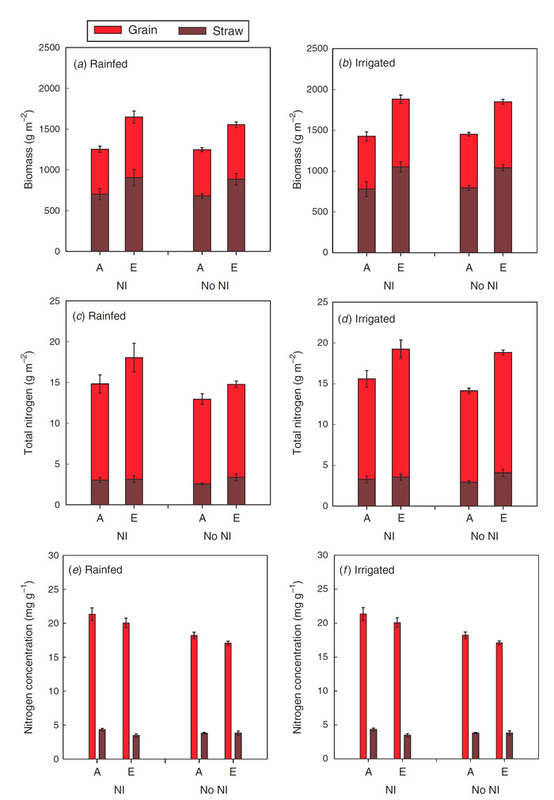 The effectiveness of nitrification inhibitor application on grain yield and quality, fertilizer nitrogen recovery and soil nitrous oxide emissions in a legume-wheat rotation under elevated carbon dioxide (FACE). Soil Research 56: 145-157. Long-term exposure to elevated atmospheric CO2 concentrations often, but not always, elicits photosynthetic acclimation or down regulation in plants, which is typically accompanied by reduced amounts of rubisco and/or other photosynthetic proteins that are typically present in excess amounts in ambient air. As a consequence of this latter phenomenon, plant nitrogen concentrations (foliar nitrogen, in particular) often decrease with atmospheric CO2 enrichment, as nitrogen is mobilized out of leaves and into other areas of the plant to increase its availability for enhancing sink development or stimulating other nutrient-limited processes. In reviewing the literature in this area, one quickly notices that despite the fact that photosynthetic acclimation has occurred, CO2-enriched plants nearly always display rates of photosynthesis that are greater than those of control plants exposed to ambient air. Consequently, photosynthetic nitrogen-use efficiency, i.e., the amount of carbon converted into sugars during the photosynthetic process per unit of leaf nitrogen, often increases dramatically in CO2-enriched plants. And, as overall plant nitrogen-use efficiency increases with the ongoing rise in the atmosphere's CO2 concentration, it is likely that plants will grow ever better on soils containing less-than-optimal levels of this important soil nutrient. Notwithstanding the CO2-induced improvement in plant nitrogen-use efficiency, concerns have been expressed that some plants might become less nutritious because of a decrease in their plant nitrogen concentration. Some studies, for example, have observed a small (6-10%) decline in cereal grain nitrogen under elevated CO2 despite an overall increase in plant nitrogen content. Consequently, researchers are searching for ways in which society might still be able to have its proverbial cake and eat it too -- to reap the benefits of increased crop yields without sacrificing grain nitrogen concentration. The latest group to conduct such an analysis was that of Sultana et al. (2018). Writing as background for their work, the five Australian scientists state that "application of a nitrification inhibitor may be beneficial as a nitrogen management strategy under elevated carbon dioxide, by enhancing ammonium nutrition, achieving better synchronization of nitrogen supply to crop demand by reducing the nitrate-related nitrogen losses, and by changing the grain nitrogen concentrations." To test their hypothesis, Sultana et al. grew spring wheat (Triticum aestivum, cv. Yitpi) for a full season at the Australian Grains Free-Air Carbon Dioxide Enrichment (AGFACE) facility in Horsham, Victoria, Australia in 2011. Elevated CO2 levels were maintained at 550 ppm during daylight hours only and were approximately 150 ppm greater than that observed in the ambient CO2 treatment. Other variables examined included (1) the presence or absence of a nitrogen inhibitor (3,4-dimethylpyrazole phosphate), which was applied three times over the course of the growing season in half of the treatments, and (2) plant water supply (half the plants were rainfed and half were irrigated). Results indicated that elevated CO2 increased both the grain and straw yield of the wheat by 26 and 32%, respectively, and that both grain and straw yields were 16% higher under irrigated conditions than under rainfed conditions (see Figure 1). Application of the nitrogen inhibitor (NI) stimulated grain nitrogen content by 15% over non-NI grown plants. Grain nitrogen content was also 19% higher under elevated CO2 than ambient CO2 and 10% higher in irrigated treatments over non-irrigated treatments. With respect to nitrogen concentration, application of the NI increased grain nitrogen concentration by 12%, whereas water supply and atmospheric CO2 concentration were reported by the authors as having "no impact." Straw nitrogen concentration, on the other hand, decreased 20% under elevated CO2 when the NI was applied. Consequently, Sultana et al. report that "as a consequence of NI the grain nitrogen harvest index (the proportion of the total plant nitrogen in the grain at maturity) increased from 79% at ambient atmospheric CO2 concentration to 82% under elevated atmospheric CO2." In commenting on their several findings, the authors say that, given the small (4%) but significant increase in grain nitrogen harvest index they observed under NI treatment conditions, the NI "may have enhanced the mobilization of nitrogen towards the grain," adding that "the higher wheat grain nitrogen concentration and nitrogen accumulation with NI use observed in [their experiment] both under ambient and elevated atmospheric CO2 conditions will have positive outcomes in terms of the nutrient value of the crop." Thus, it does appear that when it comes to rising atmospheric CO2, there is a way that we can have our cake and eat it too, enjoying both the forecasted increases in crop yields to feed the ever-growing world population without sacrificing plant nutritional quality. And that is great news worth reporting! Figure 1. Crop biomass (a, b), total nitrogen (N) (c, d) and N concentration (e, f) at maturity as affected by atmospheric CO2 concentration (ambient CO2 = A, elevated CO2 = E), nitrification inhibitor (NI, No-NI) and water supply. Source: Sultana et al. (2018).